Inspire imagination, creativity and build community through music with the Yantzee (yank-zee) Bass Metallophone. The smart compact 10 note design, Yantzee produces warm dulcet, low range voicing resembling pedal tones of a pipe organ and the distant sound of cathedral bells. 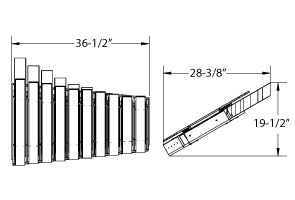 Built ready for outdoor musical fun, this simple metallophone is constructed with 2-1/2" anodized aluminum keys, 3" aluminum resonating tubes, a semi-closed housing and an HDPE frame. 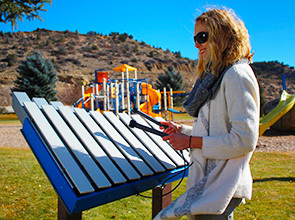 Yantzee provides an easy to use, always in-tuned opportunity to embrace musical exploration—great for playgrounds, community recreation spaces and musical parks as an foundational standalone piece or as an exceptional accompaniment for other outdoor musical instruments.